Administrative/Biographical HistoryJulia Schmucker (birth name Julia Rhea Rappaport, b. March 10, 1895, in Mihova, Bukovina, Austria-Hungary) and Rosa Baltuch (birth name Rosa Rappaport, b. February 9, 1899, in Mihova, Bukovina, Austria-Hungary) were Austro-Hungarian Jews and sisters from Bukovina, which is now part of Ukraine and Romania. Their parents were Aron Rappaport (d. 1929) and Lea Fränkel (b. 1870; d. 1941). Julia married Leo “Poldi” Schmucker (birth name Leopold Schmucker, b. December 10, 1894, in Czernowitz, Bukovina, Austria-Hungary) in around 1922. Leo was a soldier in the Second World War, though few details are known about his military service. Rosa Baltuch married Josef Baltuch (b. June 1, 1892, in Nowosielitza, Romania) in Czernowitz in 1926. Josef served in the Austro-Hungarian Common Army during the First World War. Josef and Rosa lived in Mihova and Lucaveti, Bukovina, from 1933 to 1940, and in Czernowitz from 1940 until their forced transfer to various camps. On July 1, 1941, Josef, along with 50 other Austrians, was deported to the Karaganda internment camp in the Soviet Union, now Kazakhstan. They were interned as “hostile foreigners.” Because of malnutrition and abuse, Josef remained physically and mentally unwell long after the war had ended. In August 1941, Julia and Rosa lost their mother, Lea, when she collapsed during the forced march from her home in Lucaveti to Transnistria—where the majority of Bukovina Jews were sent during the Second World War—and was killed. Rosa would later apply for compensation for the property taken from her mother during the war. In November 1942, after hiding for a time in the mountains of Putyla, near Mihova, Rosa was sent to Transnistria. She lived in the Edinets and Mogilev camps, and, after returning to Bucharest in 1943, joined her husband in Karaganda. 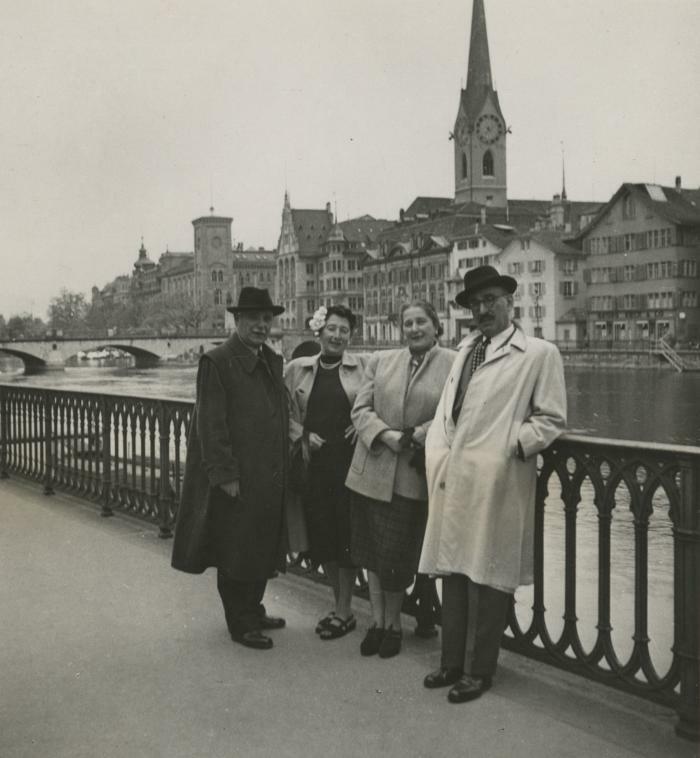 Josef and Rosa were released in October 1947 and moved to Vienna, Austria. Josef and Rosa registered as displaced persons in July 1948 and attempted to immigrate to the United States. They left Europe in May 1952, when they sailed to North America aboard the RMS Samaria. They arrived at the Port of Quebec on May 16, 1952, and settled in Montréal. Few details are known about Leo and Julia Schmucker during the Second World War, though they, too, ultimately settled in Montreal, becoming Canadian citizens in 1956. The Schmucker and the Baltuch families lived in apartments on the same street. After Josef’s death on May 26, 1956, Rosa lived with her sister and brother-in-law. Leo, Julia, and Rosa were living in Ottawa by 1974. Julia died September 22, 1979, in Ottawa; Leo on June 2, 1985. Rosa died March 17, 1994. Scope & ContentFonds consists of photograph albums and loose photos, personal records, passports, financial records, reparation and compensation claims forms, correspondence, notebooks and notes, ephemera, artefacts and published materials relating to the lives of the Baltuch and Schmucker families before, during and after the Second World War. Fonds has been arranged into the following series: Baltuch, Schmucker family photographs series ([188-]–1964); Baltuch, Schmucker family personal records series (1906–1961); Josef and Rosa Baltuch emigration and immigration documents series (1943–1961); Household and financial records (1919–1984); Rosa Baltuch reparation and compensation documents series (1934–1966); Baltuch, Schmucker family correspondence series ([before 1941]–1980); Notebooks and notes series ([before 1994]); Baltuch, Schmucker family ephemera series ([before 1994]); Baltuch, Schmucker family artefacts series ([before 1994]); and Baltuch, Schmucker family collected books series (1930–1980). Immediate Source of Acquisition or TransferRecords maintained by Rosa Baltuch after the deaths of Leo and Julie Schmucker and until her death in 1994. Records maintained by family friend, Micha Menczer, until their donation to the VHEC in 2010. System of ArrangementCollection has been arranged into ten series which reflect the major activities of the Baltuch and Schmucker families, as well as thematic divisions as it came to the VHEC. Select records, primarily photographs and some documents, have been described to the item level. Other items have been digitized as media representations of fonds, series and file-level descriptions. Date of DescriptionPrepared by Sarika Kelm in February 2017.